Barrington has developed a flexible, scalable, and meaningful approach to developing strategy and enhancing decision-making. Our reputation has been built around good research, appropriate engagement of Board and Executive personnel and effective delivery of its clients' desired outcomes: Starting at the top: we ask, “What is your organisation’s purpose?”, and use clarity of purpose to set major objectives and thus to guide the entire strategy. Analysing industry and environment: we assist with a systematic, data-driven assessment of how industry dynamics and other factors external to the organisation affect performance. Assessing capability: analysing an organisation’s value chain, we assist management identify the core capabilities required to deliver the strategy. Identifying strategic issues: experience and sound methodology tells us that it is crucial to focus on a small number of well-defined and truly strategic issues. Developing strategies: we assist in the creation of high-impact strategies to address the strategic issues and create value. Barrington can supplement your strategic planning effort on a short to medium term basis while your resources are being deployed on other priorities. 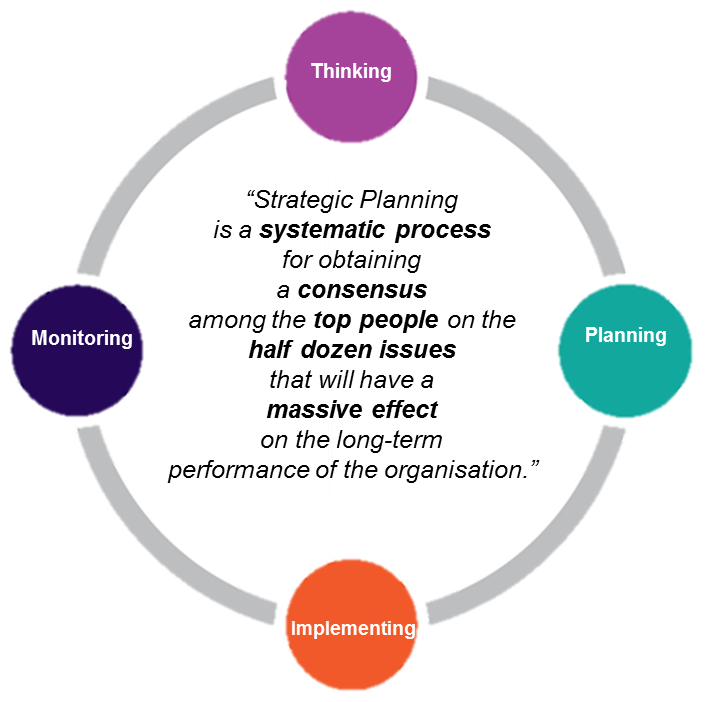 Strategic planning and implementation are most effective when embedded in an organisation. For some organisations, the luxury of having a dedicated strategic planning team is not possible given the urgency of business matters and/or the infancy of the business. The Barrington solution is to provide short to medium term (12 month program) assistance as a substitute for in-house resources while such resources are recruited, trained, and operationalised in your business. Moreover, it will be important for your organisation’s directors and executives to continue to focus on the behaviour required, through visible leadership, contribution to strategic thinking and commitment of resources while your own Strategic Planning team gets up to speed. Barrington can quickly and effectively provide Boards and Executives with an independent review of their organisation’s current strategy including performance against planned outcomes, identification of key drivers of performance, and recommendations to improve the performance of the strategy. We utilise a combination of data collection and analysis and one-on-one confidential interviews with key internal and external stakeholders to quickly establish an initial hypothesis regarding the organisation’s strategic performance. This hypothesis is stress tested and then presented to the client for initial review. Our final report presents the evidence to support the hypothesis and recommendations for action to address any shortcomings in performance. Whether you are contemplating a new market or product, an internal restructure, an investment in a new program, or a merger or acquisition, you need to get the decision right. With our diversely skilled team we pay attention to analytical, social and strategic aspects, drawing on our network of experts where necessary. So whether you are contemplating a new market or product, an internal restructure, an investment in a new program, or a merger or acquisition, you need to get the decision right. Being “successful” is generally about doing things better. At some time or another we are all confronted by the “big decision” that will ultimately impact on our overall performance and business worth. Barrington is able to assist companies make better decisions by focusing on the real issues and not the many peripheral matters that cloud our judgments. Distilling what is important is as meaningful to your success as the final decision itself. It is a management truism to say that the world is becoming more complex. But is it also true to say that the way we deal with complexity is keeping pace? Barrington uses dynamic systems models to assist clients to deal with the complex decisions they face. The approach is built up from an extensive fact base and a detailed investigation of the client’s circumstances. The result for clients is improved systems thinking that allows them to investigate scenarios and understand the potential unintended consequences of decisions.